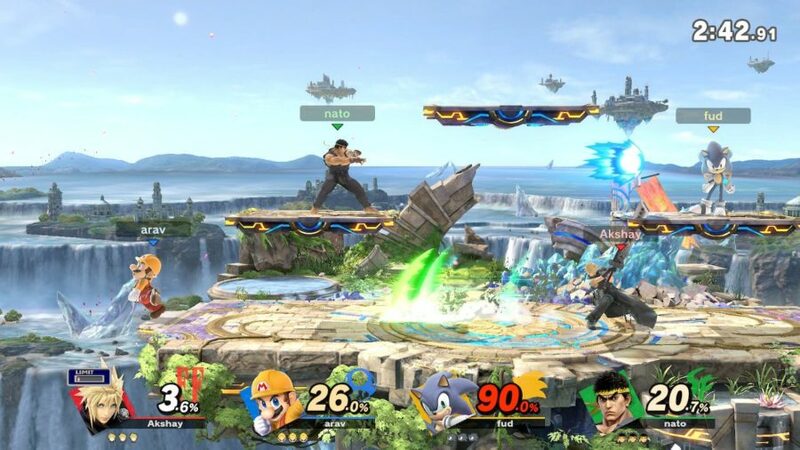 Level Up: “Super Smash Bros. Ultimate” revamps the free for all play mode with new characters options while keeping fan favorites like Mario, Sonic, Cloud and Ryu. Stages like the Battlefield arena receive a makeover with improved visuals and jaw-dropping scenic backgrounds. “Super Smash Bros. Ultimate,” the long-awaited addition to Nintendo’s “Smash Bros.” fighting game series, has finally released, and the massive culmination of video game content is outstanding to say the least. As the fifth entry in the “Smash Bros.” series, “Ultimate” aims to combine all aspects of previous games to provide the ultimate experience, holding true to its name. Bringing together 75 fighters, 104 stages, 900 songs and other content from upwards of 50 different series, the game is a content-packed celebration that prides itself on being gaming’s biggest crossover, according to virtually every source in the industry. “Ultimate” builds on the series’ biggest strengths regarding core gameplay mechanics while introducing a variety of new elements to create a more intuitive experience that pleases newcomers as well as long-term fans. Features like Spirits, Stage Morph and the World of Light adventure campaign are just a few of the many new substantial additions. That is not to say the game is flawless; there have been several complaints from fans regarding the lackluster online experience and the omission of certain game modes such as Stage Builder and Home-Run Contest at launch. There is still a lot to be desired in future updates and patches in order to make the game more enjoyable. Although the fundamentals of the game’s design have stayed strong, arguably the most defining aspect of the Smash Bros. experience is who you are playing with. Whether it be with family or with friends, the game is sure to bring smiles and laughter to anyone looking for a good time. A more robust online experience greatly expands the number of people you can play with, and with the added portability of the Nintendo Switch console, “Ultimate” can truly be played anywhere, anytime and with anyone. Overall, a combination of solid gameplay, loads of content and pure fun makes “Smash Bros. Ultimate” enjoyable, smashing fun for everyone.